Durable, practical, sophisticated. Not words you expect to describe laminate doors, right? Laminate doors are designed for high traffic areas, while offering striking colors, patterns, and finishing options to make your space look great. These doors are practical for any industry or interior: hotels, restaurants, airports, movie theaters … you guess it and laminate doors are probably there. 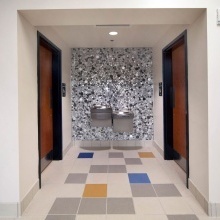 Plastic laminate is resilient and made of strong materials that can hold up to daily bumps and scratches. As a bonus, the less porous surface means it is easier to clean. 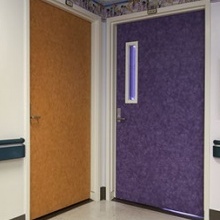 The options for staining and painting available for laminate doors make these an excellent choice for design purposes. Choose from solid colors or patterns to achieve unique or bold statements. 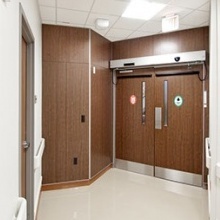 Try a wood grain material to achieve consistency in uniformity appearance from door to door. offers wood doors, laminate, stile and rail doors, with various veneers. 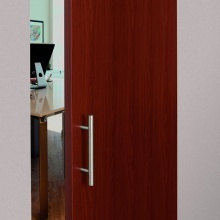 produces wood doors, high-impact doors, and fire-rated doors. makes architectural wood and decorative laminate doors. From the new Graham-Maiman, get stile and rail doors, laminate doors, specialty doors, environmental products, and wood frame products.